On February 20, 2019, we celebrate another National Love Your Pet Day, as if we had to be reminded. Back on May 8, 2015, we featured an article about the Westminster Dog Show and we waxed poetic about the virtues of having a dog and a little about the history of dogs. While we understand many people want to keep pets other than dogs (no, we really do not understand), we prefer canine companions, especially from the Hound group. Yes, we have had other pets and loved them a lot, but the dogs love you back! We here at History and Headlines have actually worked at a pet store for several years, as well as having had a variety of pets of our own, so we value the privilege of keeping animal buddies. If you live somewhere where dogs and cats are not allowed, maybe a nice aquarium or terrarium would fit the bill. Little guys like Guinea Pigs, Hamsters, Hedgehogs and the like do not take up much room, and can sit on your lap as well as any cat, and they will not climb on your tables and counter tops! Two adult guinea pigs. Photograph by Sandos (from Wikipedia). Around 68% of American households contain at least one pet. While there are supposedly a bit more cats (like 95 million!) than dogs (closer to 80 million) in the United States, cat fanciers have a tendency to own multiple cats (sometimes a LOT), so there are actually more “dog” households and owners in the USA than cat households and owners. We used to have Basset Hounds, and boy are those dogs characters! Wonderful pets and funny as heck. But Basset Hounds are pretty big (40-80 pounds), so if you are like us and you need to downsize, the Dachshund is kind of like a little Basset Hound, though more energetic. In fact, the Dachshund is often cited as the bravest or most ferocious dog, and numerous cases of Dachshunds defending their owner against bears are not uncommon. Incredibly loyal critters, the saying, “Loyal as a Hound Dog” is well founded in reality. Speaking of dachshunds (see our videos as well), there has never been a Best in Show Dachshund winner at Westminster, although this year a long haired Dachshund (also called Teckels or Badger Dogs, Wiener Dogs, Sausage Dogs, Doxies and the like) came in second place, a miscarriage of justice!!! (Some bearded dog won, what a farce!) Dogs are descended from wolves that came around ancient humans’ campfires and the friendliest developed into dogs over (probably) just a few score years, or at least not more than a couple centuries. Today, there are 337 recognized dog breeds (something like 80 breeds of domestic cat), and every single one of them is the same species, capable of producing fertile offspring with a wolf or coyote. Ranging in size from a pound to over 200 pounds, many dog breeds do not look like they are from the same planet, let alone belong to the same species, but they do. Many breeds were developed for a certain purpose, such as killing rats, racing, hunting specific animals, tracking people, herding, protecting herds, protecting people, pulling carts and all sorts of stuff. Many other breeds were developed to accentuate an exterior physical characteristic based on their looks instead of a particular job for them to do (toy breeds, etc). Mini dachshund displaying typical burrowing behavior. Photograph by Soccerman1435. While dogs have historically filled many job classifications for people as well as being “Man’s best friend” (and by this we really mean “Human’s best friend”), cats serve a critical role in civilization in keeping rodent numbers down. Without cats all over the place, rat and mouse populations would soar, bringing disease, crop damage, and chewed wires to our doorsteps. But other critters have also filled a dual role of pet and co-worker as well. We do not mean draft animals and food animals, but critters like Falcons that can be kept and also used for hunting and sport. (People in Atlanta, Georgia are known for having pet Falcons…) Horses used to be pretty much work animals (and they still are in the Amish community in which we reside), but nowadays horses are more often kept as pets, used for riding for fun instead of for real transportation, plowing and the like. Canaries used to serve as gas detectors for miners, as they are much more susceptible to poison gasses than are people. Other birds may provide decent duty as burglar alarms, kicking up a racket if someone stealthily enters your sleeping abode. We had a pet duck that used to lay eggs, which were quite good and bigger than Chicken eggs. While some commercially raised animals (cows, sheep, goats) may not seem like pet material, many people do keep them as pets and their wool or milk is useful, too. A group of Indian Runner ducks. Photograph by Johnny Jet from Southampton, UK. In Ohio and other states, recent years have seen strict laws drawn up to limit the keeping of exotic pets, both for the public safety and to curb the introduction of non-native invasive species. The release of pets such as snakes (pythons in Florida) have messed up local ecosystems and hurts native species, as have Nile Monitors, the Snakehead fish, Peacock Bass, Pacu, Piranha, Walking Catfish and other fish. The US has a problem with too many dogs and cats reproducing beyond the numbers people want to adopt as pets. Millions of these poor animals are “euthanized” (Killed, really) each year, so like Bob Barker used to say on television, ‘get your pet neutered or spayed’ and prevent an overflow of unwanted pets. 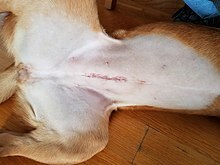 Closed spaying incision on a female dog, taken 24 hours after surgery. Photograph by Liannadavis. And by all means, LOVE YOUR PETS! If you find yourself too busy to properly care for your animal buddy (buddies), please do not neglect them (you may find yourself on the local news or some sad commercial on television), and instead find someone who wants them. If that is too much trouble, contact your local animal shelter. Questions for Students (and others): While we are convinced that Basset Hounds and Dachshunds are the greatest pets in the world, we welcome you to nominate the breed or species you believe is the best pet. If you have a favorite pet story, please tell us. Beauchesne, Ryan. Crusoe, the Celebrity Dachshund: Adventures of the Wiener Dog Extraordinaire. St. Martin’s Griffin, 2015. Hajeski, Nancy. Every Dog: A Book of Over 450 Breeds. Firefly Books, 2016. Ruthersdale, Roland. Pet Ducks. 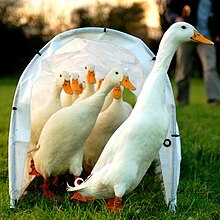 Keeping Ducks as Pets Owner’s Manual. IMB Publishing, 2014. Shojai, Amy. Cat Facts: The A-to-Z Pet Parent’s Home Care Encyclopedia. Furry Muse Publications, 2015. The featured image in this article, Die Dackelfamilie mit Jäger und Magd by Adolf Eberle (1843–1914), is a faithful photographic reproduction of a two-dimensional, public domain work of art. The work of art itself is in the public domain for the following reason: This work is in the public domain in its country of origin and other countries and areas where the copyright term is the author’s life plus 100 years or less. This photographic reproduction is therefore also considered to be in the public domain in the United States.